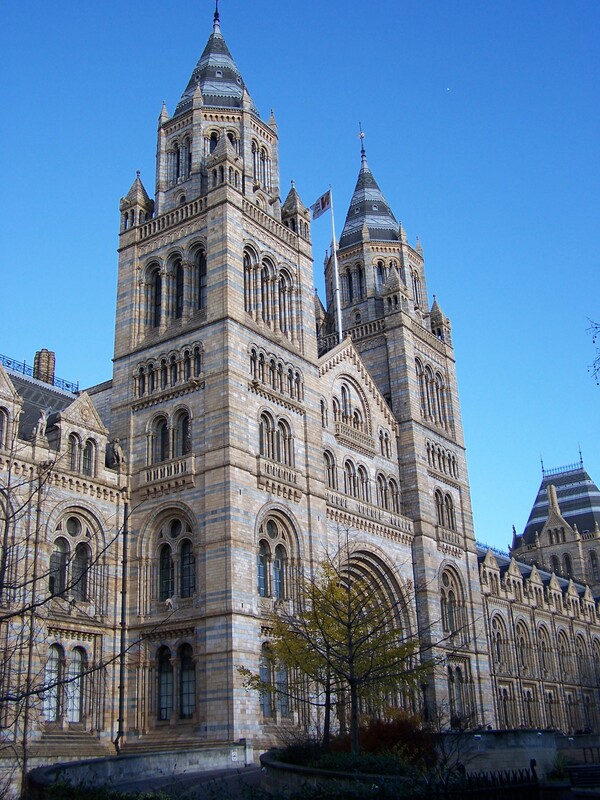 Designed by architect Alfred Waterhouse, the Natural History Museum is an architectural marvel; the building’s interior equally engaging as the exhibits it houses, due to the intricate mixture of Gothic Revival and twelfth-century Romanesque-style architecture. The attention to detail is what strikes me as most interesting; the vast number of indentations and layers add up to create an almost mechanical seeming structure. It comes as no surprise, then, that Waterhouse was also responsible for the likes of Manchester Town Hall, Eaton Hall, Rochdale Hall and numerous other historic buildings. Striking detail is a consistent feature of Waterhouse’s work and this element is underscored by his fondness for symmetry. By providing interesting forms at all angles it means that, regardless of viewpoint, one always encounters an impressive level of meticulous detail. The addition of stone monkeys traversing the pillars of the museum is a very nice touch, an intriguing tribute to the exotic wildlife skeletons and exhibits, and may possibly even be an oblique reference to Charles Darwin. Amongst other appearances in the museum, Darwin is given a statue, a reminder of the museum’s involvement not just in exhibiting the past, but also its eagerness to support scientific studies in the future. 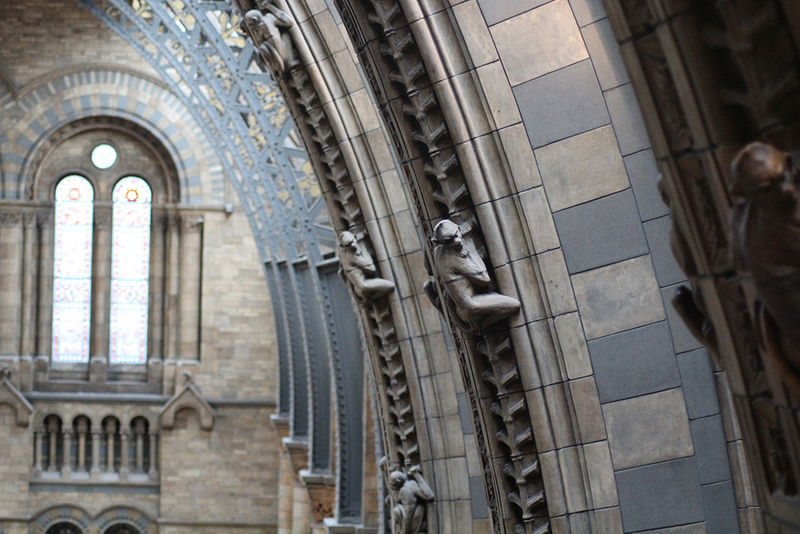 Interestingly the building was completed in 1881, just a year before Darwin died. What springs to mind is: what if every building looked like this? What if the level of quality found in its walls was evident in even the most basic of structures? The idea of a city as large as London, for example, with skyscrapers, shopping centres and bridges sharing the stone intricacy of classical buildings, is both a thought provoking and curious concept. This kind of attention to detail was usually reserved for religious buildings or locations of other particular prestige. Thus the notion of walking into a grandiose and visually astounding Tesco’s would be surprising to say the least, as noble and dramatic aren’t common connotations of such an establishment. Moreover this idea also poses an interesting question: what if, to accompany the large steel contemporary buildings we have now, brand new classical buildings were constructed. Now, much of the success of such a proposal would depend very much on the location of such a structure and even then one could argue that the very fact that the building would be made in the 21st century would detract considerably from the whole point of making it. The intellectual atmosphere and level of technique of the time a building is constructed are fundamental to the soul of its creation, its essence, and to ignore this would undermine its purpose and indeed its integrity. A project vacant of soul is a project void of purpose. Why build something out of its time? If what we seek is architectural artistry, then that is abundant in many of today’s modern designs. That said, it’s worth reflecting upon just how much modern architecture still draws inspiration from all that has gone before. Not to mention that what makes a building truly great is not when it was built, but rather its quality: the coherence of its conception and the success with which it is realised.